If you plan to fly into Orlando International Airport, you'll have to figure out how to get from there to your resort. In this post, I compare many good options (from free to pricey) to help you decide what makes the most sense for your trip. This motorcoach option is available to guests staying at onsite Disney World resorts. A shared shuttle van that is a good option for offsite guests without their own cars. No reservation required and easy to find at the airport. Other locations for pickup/dropoff: Just about anywhere. If your pickup spot isn't an area where taxis line up, you can call or use the app to request pickup. Although the lower levels of Uber service didn't used to be allowed, all levels are now allowed to pick up. 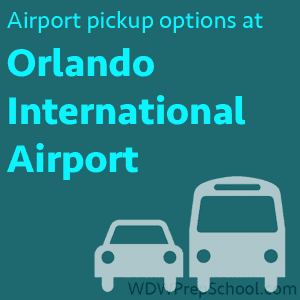 The lowest level of Orlando International Airport has rental car desks, and there are even more companies just outside of the airport accessible by shuttle. Other locations for pickup/dropoff: Obviously if you have your own car, you can go wherever you'd like. 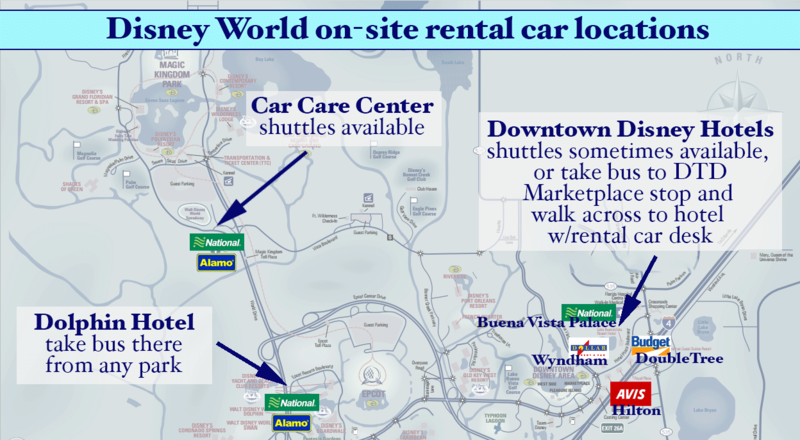 If you want to pickup or drop off a rental car in the middle of your trip, you can do so onsite at Disney World. See this chart for locations. 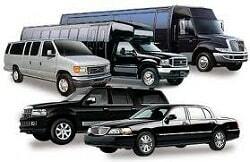 There are many private car service companies available to go from the Orlando airport to Disney World. Here's what they typically charge and offer. Though I've used car other service companies in Orlando before, the service has always been inconsistent. Orlando Transportation by Mike is a fantastic company that provides great service and gets great review from WDW Prep readers. Have any thoughts or comments on getting from the Orlando airport to Disney World? Feel free to share in the comments. I just booked Mike for our November 2019 trip and am already impressed with the service. I made our booking through email and Mike called me shortly after to confirm everything. I had been concerned that the website mentioned booster seats as opposed to carseats and before I could even ask, he reassured me that they had carseats. He was very pleasant and professional. Thanks for the recommendation! I like that you mentioned that those who do meet-and-greets will also be helping you with your luggage. I guess I need to find a company that can offer that since we will be having lots of things to carry. These are luggage filled with costumes of my daughter who will be joining a pageant for the first time. I really appreciate your information that shuttle pick ups are usually around $20 per person. My husband and I are going to Florida to enjoy a bit of summer weather before the cold kicks in up north, so it would probably be more cost effective this way. Maybe we can use the funds that we are saving toward more souvenirs. If I book with Mike, what would my Pick Up Location be coming from a Canadian flight? Hi Shannon, We are going to be booking with transportation by Mike, But can we still have disney take our bags to the hotel if we dont go on the ME? Or if we cancel the ME, do we have to also get our own bags? Thanks for all the info! You can’t have them transport your bags from the airport to the resort, but you CAN have them transport them on the way home by using Resort Airline Check-In. Due to a late arrival at MCO, we did not want to ‘wait’ on a bus, then ‘wait’ on resort stops. We took your recommendation and used Orlando Transportation by Mike. IT WAS THE BEST!!! We used the service round trip and were impressed. Best prices, clean vehicles, pleasant drivers and we will use Mike’s company again. we have just come back from Orlando and we used mike to collect us to and from the airport. He was very professional and the service was great defiantly recommend them. Thanks for all the info, Shannon! Is there a way to use Mike to leave directly from a park? Not sure what we would do with our luggage in that case. We’ve already made Magical Express reservations, do we need to cancel those if we decide to use Mike instead? For the return trip, can we still check our luggage in for the ME & use Mike’s service? We just got back from Disney. We used Orlando Transportation by Mike both ways. Mike was super professional and very responsive. He was waiting for us as we descended the elevator to baggage claim when we got there and again for us as we walked out of our hotel (even though the departure was on his birthday!) His vehicle was comfortable and very clean. His service was impeccable. I’d highly recommend him. Can we use Mike to get to our hotel but use Magical Express on the way back to the airport? We are flying to Orlando and staying on property at Disney. We are going to Sea World one day during out stay and would like to know the best way to get there. Since we are flying I will not have car seats and have a 4 and 7 year old. D) often the seats are very old and/or expired (or could be recalled! ), which is incredibly unsafe for a number of reasons. We use Super Shuttle because I use a power wheelchair and they have the ability to pick us up. I used them the last time we were there and when we go next year, I will call them and schedule both pick up from the airport and when we leave the resort to take us back to the airport. I have used them at Disneyland San Diego and when I was in the military, and never had an issue. The prices are not that bad and you can request a non stop to the resort. We are starting our WDW trip with 3 days at Universal. So we can not use the ME to start our trip. Would you suggest Orlando Transportation by Mike then to get us to Universal? Mike will run around $40 each way to go from WDW to Universal. Taxis will run about the same, and Ubers are about half that price (assuming there’s no surge pricing). Mike will provide car seats and personalized service which might make the most sense, depending on what you need. We are planning same scenario as Amy- except starting our trip with 2 days Universal. I think she’s asking if you’d suggest Transportation by Mike from MCO to Universal. I think we will take Uber from Universal to WDW. 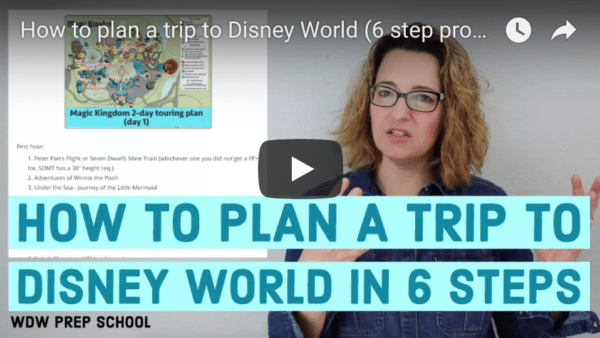 If she was asking about MCO to Universal, then I’d definitely suggest Mike for that. Thank you! I was asking about getting from MCO to Universal so it sounds like Mike is the way to go. Woah, I didn’t realize the Magical Express took so long! Thanks for this post. Looks like I’ll be revising our plans for next month ? We’ve used ME 3 times and I don’t think it has ever been as much as 3 hours. Probably closer to 2. Each time was a bit different. The luggage took the longest. So if you need your luggage at a specific time, I would suggest you take it on the bus with you. Our plane left late one trip, which pushed everything back. We had a Boutique reservations and we did not have our daughter’s dress for the princess make-over by the time we had to leave for Disney Springs. I like the ease of the ME bus, personally. I’ve been taking Magical Express for 11 years. Most of the time it takes around 2 hours, but I have had 1 or 2 trips that were closer to 3. It’s good to allow that much time so you don’t miss something important (like a dining reservation), but hopefully it’ll be less.